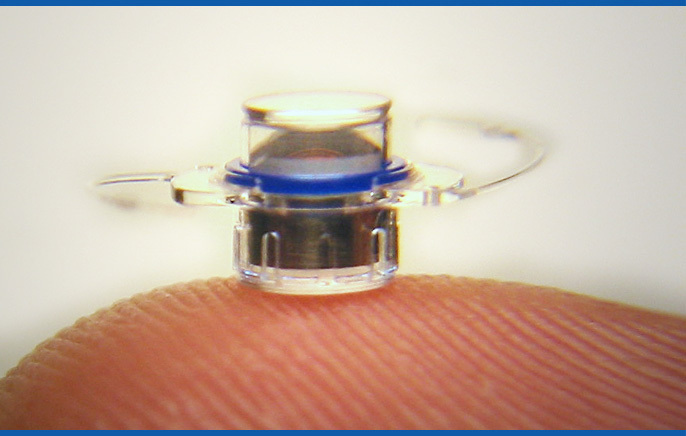 The telescopic intraocular lens developed by VisionCare™ Ophthalmic Technologies and CentraSight is designed to help people who have lost their central vision from end-stage macular degeneration. It’s patterned after a telescope to give patients enough magnification to help them improve their vision. The lens is placed inside the eye during cataract surgery. There were two multi-year clinical trials conducted to evaluate the safety and efficacy of the telescopic intraocular lens: IMT-002 pivotal safety and efficacy study and IMT-002-LTM long-term monitoring safety study. The two year twenty eight-center IMT-002 study evaluated the safety and efficacy of the telescopic lens. In the study 90.1% of patients achieved at least two lines or greater on the vision chart in improved vision. Sixty percent of patients achieved three lines of best corrected distance vision. The long-term monitoring study demonstrated that the improvements were generally retained four years later. The National Eye Institute Visual Functioning Questionnaire-25 was used to access the quality of life improvements. A five-point difference in subscale or composite scores may be interpreted as clinically significant. The Questionnaire was administered prior to surgery and post-surgery. The results showed that the telescopic intraocular lens improved the quality of life in this clinical setting. The mean composite score and the scores for nearly all relevant sub-scores were clinically significant. There was also significant improvement on the psychosocial vision targeted dependency, mental health, role difficulties, and social functioning subscales. The clinical trial results show that the patients were less dependent on others, less worried or frustrated with their vision, less limited in their activities, more mobile, and better able to recognize faces. In about five percent of cases, it may not be possible to implant the telescopic intraocular lens and a regular type of intraocular lens will need to be implanted. The cornea (clear portion of the eye in front of the iris) may develop edema. In about twelve percent of patients, the endothelium (layer of cells lining the inside of the cornea responsible for keeping the cornea clear) has a low endothelial cell density which leads to edema of the cornea and blurred vision. In the five years of the study, nine percent of patients had persistent corneal edema resulting in corneal transplant in four percent of patients. The risk of losing more than two lines of vision on the eye chart was approximately twelve percent. During the five year study period, four percent of patients had the telescopic lens removed. This second surgery will cause more loss of endothelial cells. 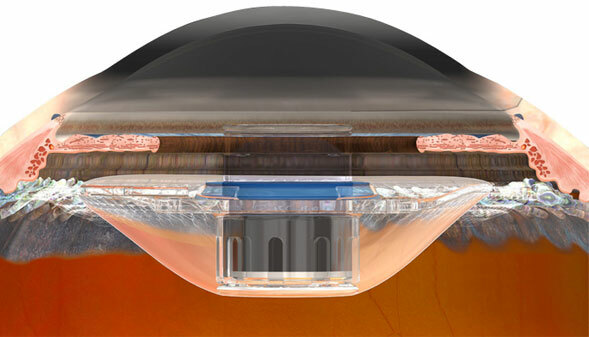 The telescopic intraocular lens for end-stage macular degeneration is a FDA approved procedure for patients who have lost their central vision. If you have cataracts and are a good candidate for this procedure, it is possible that you can improve your quality of life living with your macular degeneration. how much is this telescopic intraocular lens?